Most cellular devices rely on SIM cards, and while with micro and nano SIM, the card has become smaller the electronics and connection remains the same. More recently, we’ve started to see boards featuring eSIM (embedded SIM), a chip soldered directly to the board that’s remotely provisioned by a local mobile network operator, so no more card needed, and the chip should not be tied to a single operator, so you can change plan whenever you want. But soon we won’t be able to find out if a board supports cellular connectivity by looking for a SIM card slot or eSIM chip – although the antenna(s) will still be there, and give a pretty obvious clue – , as Arm has now unveiled Kigen that integrates SIM identity directly into SoCs for the Internet of Things. This will enable what the company (the industry?) call integrated SIMs (iSIM) combining an application processor, a radio, SIM card/eSIM, and crypto hardware (e.g. Arm CryptoIsland) into a single package. 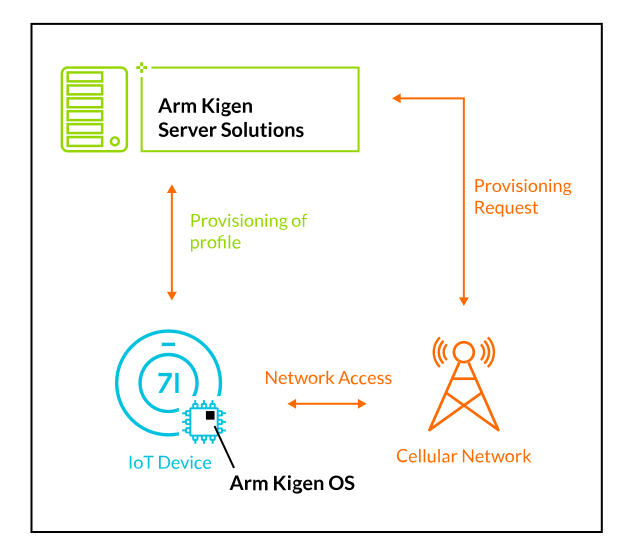 The solution will run Arm Kigen OS, a scalable, low footprint and GSMA compliant software stack, and offer remote provisioning server solution for easy integration with MNO (Mobile Network Operator), and IoT platforms thanks to features like Over-the-air (OTA) updates, and the availability of REST/SOAP APIs. Kigen will work with traditional 2G/3G/4G networks, beside the new IoT-focussed networks such as NB-IoT/LTE-M and the upcoming 5G network. The main improvements over eSIMs is that Kigen should allow for smaller and potentially cheaper cellular IoT devices. Visit the product page for further information.